A Double-Elimination, as the name states, is composed of a dual bracket, an Upper one (for winning participants) and a Lower one (for participants having lost a match), referred to as Winners and Losers brackets. Would it be because your structure follows specific rules, or a personal wish to change, or even randomize, the matches being played in the Losers Bracket, you may want to edit the placement of participants in this particular setting. What you see next is a visualization of the bracket, with seeds. Matches not yet reached, or that already have a result, are locked. After the swap is effective, you will see the corresponding matches highlighted in green, to remind you of the change you just made. 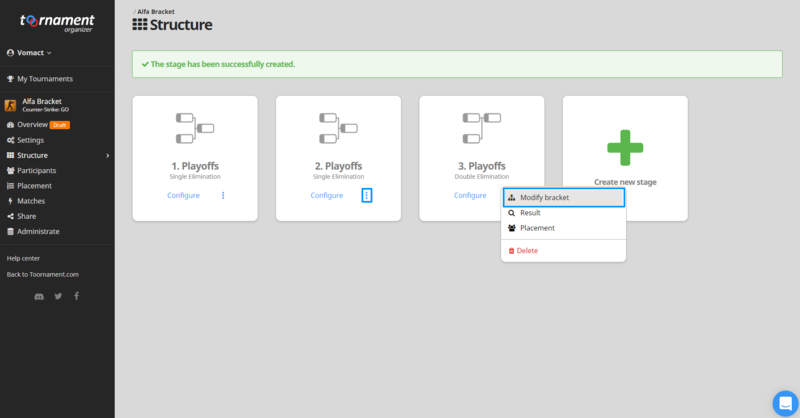 As you probably noticed, you can also change the position of seeds in the Winners Bracket, and even in a Single-Elimination Bracket, with the same method and result.